The book suggested everybody has a different mind, with no two profiles of intelligence the same, so the traditional concept of measuring intelligence by I.Q testing is too limited. 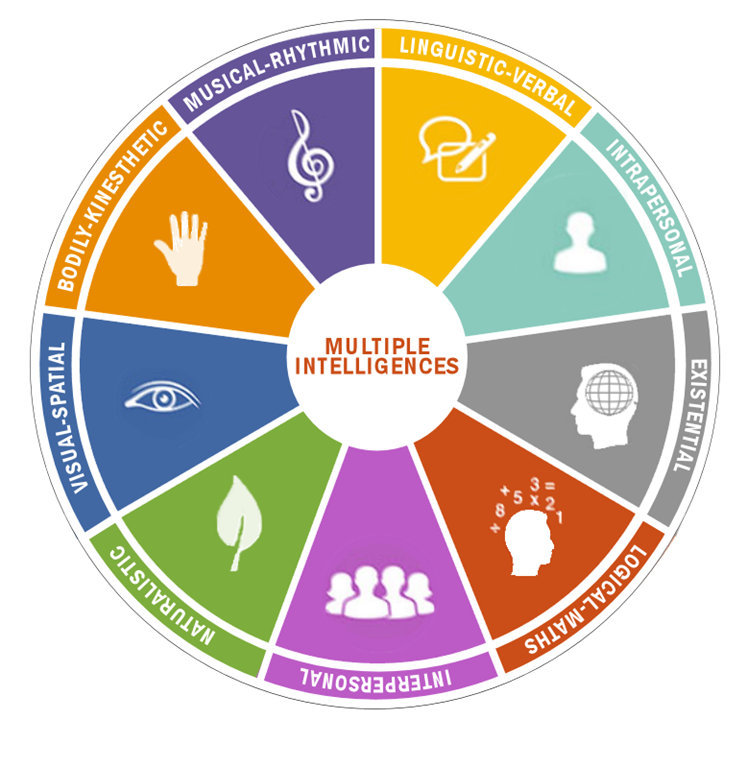 Gardner described an original seven (now 8 or 9) primary intelligences. A person can prefer and dominate in 1–3 of these, and will contain all 8 but at various levels of aptitude. Since the initial seven, with peer feedback, Gardner added a further eighth intelligence – naturalism, and has hinted at another two – existential intelligence and moral intelligence. A writer’s entry on creating smart characters, linking to MI’s. Although the education system tends to use MI’s as “learning styles” Gardner points out that learning styles are different. There are several attempts to classify learning styles – VAK (see above), left or right brained, impulsive vs reflective or several others. 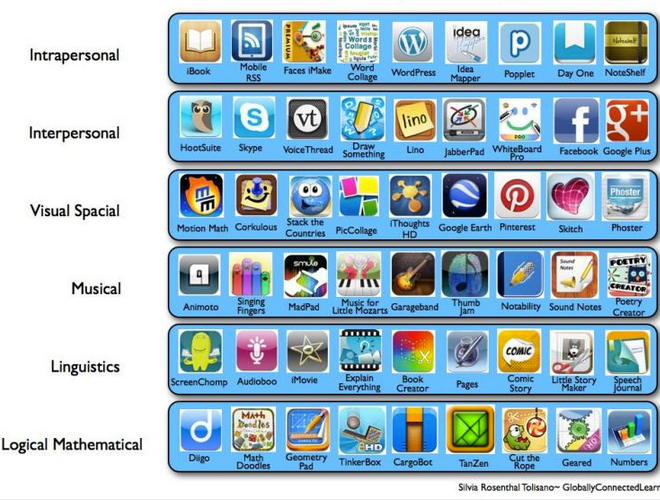 Many of these learning categories can fit roughly into the MI framework, with the closest match taken up by schools being that of Bloom’s Taxonomy. But intelligence is larger than learning. Knowledge of our own personal intelligence types provide ways of applying these across a life to drive our human potential and endeavours throughout our lives, including in our writing. Below are brief summaries. For a much more detailed description, please download the bonus PDF “Multiple Intelligences for Writers” here. This document, created especially for writers, includes each intelligence’s traits, names, relevant roles, examples from real-life and fictional characters, and as a writer bonus, relevant character archetypes for each, helpful for character development. Naturalist intelligence users have the ability to recognize and categorise plants, animals and other objects in nature. Existential intelligence relates to a sensitivity and capacity to tackle deep questions about human existence such as, What is the meaning of life? Why do we die? How did we get here? My next step was to work out my own MI’s. This is a PDF test, written by Walter McKenzie in 1999, available directly here. This quiz includes Existential Intelligence questions. This online test at BGFL will display a nice graph for you. Only the eight intelligences. This is another at Edutopia. This one requires Flash, but has some interestingly different questions. Here you will find a 70 question excel spreadsheet which really nuts out the first 7 intelligences. Note that each assessment linked above has different questions per intelligence. I recommend taking a few of them to qualify your own results, particularly where something feels just plain wrong to you. Okay, so it was time to consider what I wanted to get out of this. Writing isn’t a process. In fact, writing is the product at the end of writing – the complete project. I could spend all my time working on my process, yet not deliver something. All of these writing phases may blend, but importantly, each phase requires differing mindsets, skills–and intelligences. After nearly half a century on this planet, I have a reasonable understanding of myself, so my results weren’t startling. The findings for linguistic (or words) was disappointing for me as a writer (but came about because the questionnaire focused on verbal questions). After taking a few more tests to confirm my results, my logical, linguistic-words and interpersonal intelligences rose. Top Intelligence Tier (1-3): mine are intrapersonal, followed a little below by naturalistic, visual and linguistic-words. I considered how these results matched and could inspire a better writing process for each of the writing phases. As an example, my highly preferred intrapersonal intelligence is fabulous for the hermit writer in me, doing the ideation and creation phases above. But it’s not great for other phases like editing, which requires feedback from shock – other people. Writers with an interpersonal bent, however, may suffer through the generally quiet and lonely task of the earlier writing phases. To bring in their higher interpersonal intelligence you may see these writers writing in cafes or public places, frequenting writing groups or collaboratively writing. I’ve tried and failed at doing all those things and now know why. There was also a discrepancy with my musical result, due to the fact that as an HSP, powerful music can overcome my emotions. So I purposely avoid music unless I want to empower and energise certain parts of my life – and writing. You may find you will need to analyse many of your MI results as relevant to what you know about yourself. With this analysis I began to see how I had previously and very successfully setup Ideation and Creation writing processes which use my top and middle tiered MI’s. But I also now have the reason why in later processes such as revision I often get stuck. These need more logical and interpersonal skills – and I need to practice to strengthen them. To do this, I need to include bits of them in my favourite phases also. Below are my own examples. by: getting out into nature (naturalist and spatial) and taking frequent energetic breaks (kinaesthetic) as these last two will re-energise you during working time. don’t: spend too much time on logic, analysis or statistics (logical-mathematical) and avoid people (interpersonal) during first draft work. Repeat: 2-4 for each draft.